The placenta is a transient organ that serves as the interface between the fetus and the mother. It has a multitude of critical roles in maintaining and protecting the developing fetus throughout the pregnancy. Specifically, it facilitates the exchange of gases, nutrients, and waste products, serves as an endocrine organ producing a number of pregnancy-associated hormones and growth factors, as well as ensuring the protection of the fetus from maternal immune attack. As such, any problems with the development of the placenta negatively impact the health and survival of the fetus. The establishment of the fetal-maternal interface is complex and tightly regulated requiring the precise and coordinated differentiation of placental progenitor cells, cytotrophoblasts. Soon after implantation, cytotrophoblasts at placental anchoring villi, which serve to attach the placenta, bud off and invade the uterine wall. This invasive pathway depends on the proper differentiation of cytotrophoblasts into two types of extravillous trophoblast cells (EVTs): interstitial EVTs that invade the decidua and endovascular EVTs that are key players in the remodeling of maternal uterine spiral arteries. Proper remodeling of these muscular uterine vessels from high-resistance and low-flow to low-resistance and high-flow is essential for the adequate perfusion of the placenta to support and sustain the increasing requirements of the growing fetus. Shallow EVT invasion into the uterus and poor endovascular EVT mediated remodeling of spiral arteries are central contributors to pregnancy complications, such as preeclampsia. Affecting up to 8% of pregnancies worldwide, preeclampsia is the leading cause of maternal and neonatal morbidity and mortality. This disorder is characterized by hypertension and damaged to multiple organs, such as liver, kidneys, lungs, and brain. Despite great effort, the diagnosis of PE is currently limited to late second trimester at the onset of clinical maternal symptoms of hypertension and the presence of proteins in the urine. Currently the only treatment for PE is delivery of the baby and the placenta; however, this often leads to preterm birth. Although PE is considered to be a late-pregnancy disorder, the molecular events leading to its onset have been suggested to occur early in pregnancy with the placenta as the origin. The molecular mechanisms governing the development of these two distinct EVT subtypes are critical for elucidating the etiology of PE. microRNAs are small non-coding RNAs that play important roles in regulating gene expression. They have been identified in the placenta and reported to regulate trophoblast activities; however, their role in endovascular EVT differentiation and uterine spiral artery remodeling was unknown. In the study published in Molecular Therapy, we investigated the function and mechanism of miR-218-5p, a microRNA found to have a lower level in placenta from preeclamptic patients, in endovascular EVT differentiation and vascular transformation. We report that the level of miR-218-5p is greatly upregulated in the EVT population at the time of deep invasion and endovascular EVT differentiation. Using both established cell lines and human placental explants, we demonstrate that miR-218-5p promotes EVT migration, invasion, and endovascular EVT differentiation. Investigation of the mechanisms involved in spiral artery remodeling has proven difficult. There is a complex interplay of maternal and fetal factors that progressively remodel these vessels during the first 22 weeks of pregnancy. In this study, we are first to demonstrate the experimental manipulation of an ex vivo model of human spiral artery remodeling whereby we directly tested the role of miR-218-5p in this process. First, we collected matched samples of the first-trimester placenta and uterine tissues from patients. 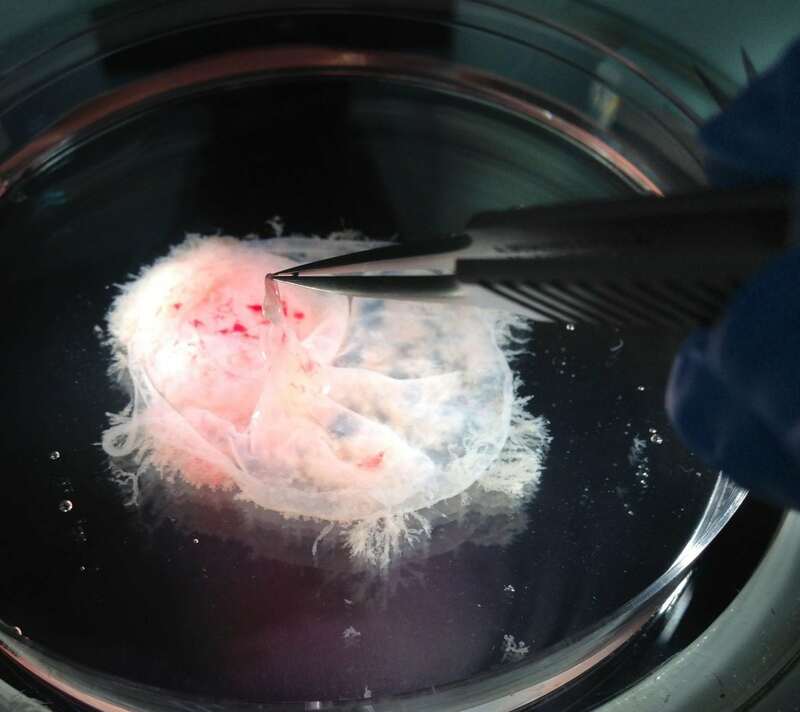 Next, we pre-treated placental explants with miR-218-5p and let them attach to the uterine tissues. We allowed the co-cultures to progress over 6 days in a uterine-like environment at which point we assessed the degree of remodeling of the spiral arteries. Our results demonstrate that samples pre-treated with miR-218-5p accelerated the vessel remodeling process compared to control samples and induced expression of endovascular genes in EVTs found in the remodeling vessel. This suggests that miR-218-5p action may upregulate genes required for the differentiation of endovascular EVT resulting in an increased pool of endovascular EVT available for remodeling. The second way by which miR-218-5p accelerates spiral artery remodeling may lie in the upregulation of immune-responsive molecules. Crosstalk between placental cells and the immune cells of the uterus is vital to the establishment of a healthy fetal-maternal interface. In uterine tissues co-cultured with miR-218-5p-treated placental explants, there was an abundant recruitment of immune cells along the entire length of the remodeling vessel. Furthermore, miR-218-5p-treated placental explants secreted higher levels of several pro-invasive and pro-angiogenic molecules. These data support that miR-218-5p promotes the attraction of uterine immune cells to the site of vessel remodeling. To understand the biological function of a miRNA, it is important to identify its regulatory targets. Considering that miRNAs can target mRNAs through imperfect binding, each miRNA has the potential to target many different mRNAs. In this study, we show that miR-218-5p targets and downregulates TGF-β2. The growth factor TGF-β2 is a member of the large transforming growth factor (TGF)-β family that plays fundamental roles in many cellular processes, such as cellular proliferation, differentiation, apoptosis, and angiogenesis. While the TGF-β pathway has been implicated in placental development, its role in endovascular EVT differentiation and vascular transformation has not been reported. Our findings suggest that TGF-β2 exerts a negative effect on EVT invasion and endovascular EVT differentiation. Furthermore, we show that the pro-invasive and pro-angiogenic effects exerted by miR-218-5p is in part due to the suppression of TGF-β2. These findings suggest that miR-218-5p is important in normal placenta development by limiting the TGF-β2 signaling and that down-regulation of miR-218-5p, and in turn, the upregulation of TGF-β2 may contribute to the development of preeclampsia. With millions of pregnancies adversely affected by preeclampsia each year, there is an urgent need for an effective screening of patients that are at high risk of developing PE prior to the onset of symptoms. This will allow for the development of preventative and therapeutic strategies that will minimize the burden of preeclampsia. Circulating microRNAs are detectable in patients’ blood and the utility of miR-218-5p as both a predictive and prognostic marker in cancer has been suggested. Our data suggest that miR-218-5p is an excellent candidate for further investigation into its use as a predictive biomarker and a therapeutic target for preeclampsia. These findings are described in the article entitled MicroRNA-218-5p Promotes Endovascular Trophoblast Differentiation and Spiral Artery Remodeling, recently published in the journal Molecular Therapy. This work was conducted by Jelena Brkić, Jacob O’Brien, Guodong Fu, Lubna Nadeem, Mohamed Salem, and Chun Peng from York University, Caroline Dunk, Oksana Shynlova, and Stephen J. Lye from Mount Sinai Hospital, Toronto, Yan-ling Wang from the Chinese Academy of Sciences, David Rosman from Mackenzie Richmond Hill Hospital, and Issaka Yougbare and Heyu Ni from St. Michael’s Hospital, Toronto. Jelena is a research scientist at York University. Dr. Peng’s primary research focuses on female reproduction and women’s reproductive health. Her lab uses a variety tools in cell and molecular biology, biochemistry, physiology, and bioinformatics to investigate how growth factors, hormones, and microRNAs regulate oocyte maturation and placental development and how their dysregulation contribute to the pathogenesis of preeclampsia. In addition, her lab studies the molecular mechanisms underlying the development of ovarian cancer. Current research projects in Dr. Peng’s lab include: 1) MicroRNAs and Growth Factors in Placental Development and Preeclampsia; 2) Role of Cyclin G2 and MicroRNAs in Ovarian Cancer Development; and 3) Regulation of Zebrafish Ovarian Development and Oocyte Maturation. Her work is supported by CIHR, NSERC, CFI/ORF, and York University.